Have you found an online vendor selling Angostura Cask Collection Number 1 Batch 1? Smooth with a non-cloying sweetness. Reminiscent of maple syrup. My favorite go-to rum. I only have five bottles, and I don't know how I will make it last. UPDATE: I now own 46 bottles, having cleared out the inventory of California, Arizona, and Minnesota. I'm also upgrading my rating from 9 to 10, which only stands to reason. If this is one's go-to favorite, then a 10 rating only makes sense. Otherwise, what does a "10" really mean? Très bon rhum, assez similaire au 1824. Très doux et délicieux, un vrai nectar. Même si j’ai une préférence pour le 1824 qui dure plus longtemps en bouche et qui est un peu plus sec, celui ci n’en ai pas moins excellent. Very good rum, quite similar to the 1824. Very smooth and delicious, amazing. Although I prefer the 1824 because it last longer in the mouth and is slightly drier, this one is excellent as well. Purchased a sample from Master of Malt for £8 after the trying the 17 18 and 19. It's spent 10 years in oak casks and another 6 in French ex cognac. Nose is inviting with caramel and fruit and touch of complexity. Very nice flavour sweet and rich in the mouth wonderfully smooth. Just delightful to sip. Added coffee flavor like in those Dictador rums, they do not make it anymore but there is nothing to regret. I thought it was completely sold out in Europe, but then I found some bottles on a German site to complete my last bottle. So now I have four of it. In the aroma you smell nuts and it’s quite sweet, but not too sweet. The taste is very smooth, len and sweet. The sweetness is a little bit alike almond paste. In the finish I believe you can recognise both apple, vanilla and chocolate. If you get the opportunity to buy a bottle of it, don’t hesitate. BUY IT!!! Now I also have tested the 3rd Edition but it didn’t reach the level of the 1st and 2nd. This is a very good cask rum , plenty of bite which made me think it was higher than 40%. It needs to be left in the glass for at least 15 mins , has a strong alcohol aroma which takes a bit of clearing ! Beautiful colour and a nice presentation. Still a strong mouth feel but pleasurable , tastes of barrel , molasses and quite spicy. Its sweetish but not over the top , short finish but a great tasting rum overall. Also good value over here which makes a pleasant change !! Leeecker Rum, süss und mit langem Abgang. Ein leckerer Rum für den Abend. Für mich hat dieser Rum einen schönen langen Abgang im Gaumen. 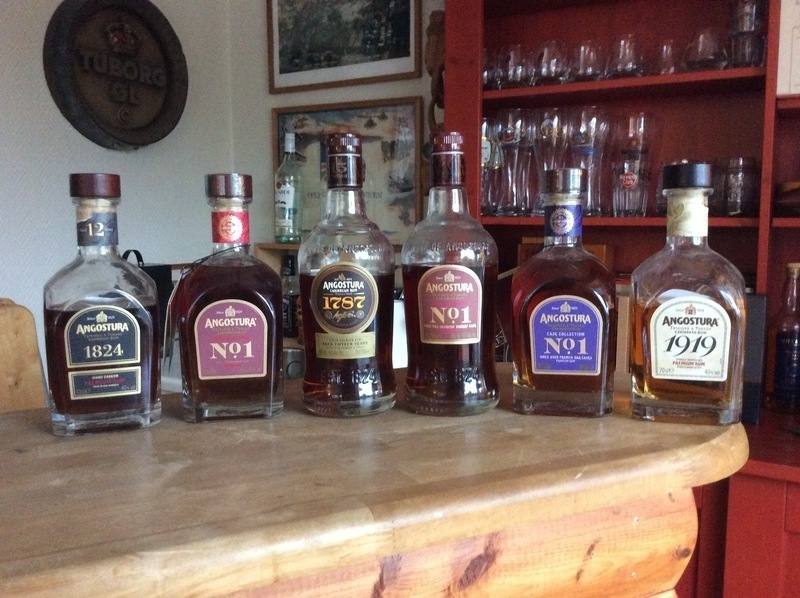 The maestros of the Angostura again prove what they can. Very spicy, sweet & fruity top rum, with a tast of the Barrel. Excellent rhum sur des notes pâtissiers de Chovolat ,de café très léger se mêlant au caramel.doux et subtil ce rhum est délicieux et complexe.un peu dans l esprit d un Zafra 21 ou d un 1824 ,mais plus sucré.A essayer.beau coffret rouge...prix 64e e. 2016 à grauonline. the older the rum get, the more sugar comes in? thats not good! much more sweetness than in his younger brothers 1919 and 1824.
plum. vanilla. caramel. oak. chili. typical rum character. much too expensive for that taste and stickiness. 5/10 and not my bottle! if you like it sweet, maybe thats a real deal for you! En riktig smakexplotion i början, söt inledning som övergår i lite spritigt mellanregister för att sluta med en låång romrussin/ kolasmak, liten ton av ek. Wow, many "haters" out there for this brand. For $60 online at the time, I figured that I had nothing to lose...WOW, when I sipped it blind vs. another brand, I was blown away. Months later, finished the bottle and now cannot afford it!!! Vanilla, caramel and marshmallow notes with molasses and spice finish. One of the best rums I've tasted. The aroma doesn't tell that much but what I lacks in aroma it takes back in flavor. It's very smooth and well balanced. En dejlig blød rom med noter af bl.a karamel. Den er fyldig i smagen og egner sig til at sippe stille og roligt foran pejsen. Caramel, and cocoa are predominant in my bottle, with citrus making an occasional appearance. Sweet but not overly so, an excellent addition to the collection.